Smart Tweezers LCR- and ESR-meter from Siborg Systems Inc.
Siborg Systems Inc. will be showing LCR-Reader and LCR-Reader-MP at this year's IEEE International Electron Devices 2017 in San Francisco from December 2-6 2017! Now in the LCR-Reader Store, Smart Tweezers Offset Calibration Board. This dummy PCB uses holes to represent various sizes of components (0201, 0402, etc). Instead of the less accurate method of estimating the components width to determine the offset capacitance, the Offset Calibration Board lets users get a precise offset capacitance that can be subtracted by the component's measurement. The Offset Calibration Board works with Smart Tweezers and Colibri models of LCR-meters; simply set the device to 10kHz and "measure" the component size on the PCB by placing the tips in the corresponding holes to the component being tested. The device will show the actual offset capacitance value that can then be subtracted from the value of the component being measured. 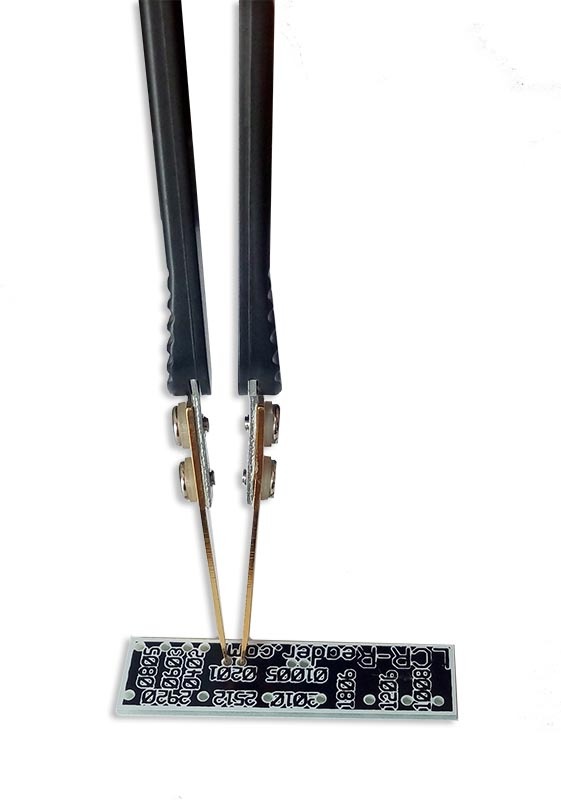 The Smart Tweezers Smart Tweezers Offset Calibration Board is available alone for $9.99 USD or inside all Smart Tweezers Pro and Plus Task Kits. Siborg is now offering two new sizes of pin probes for the LCR-Reader Kelvin Probe Connector. 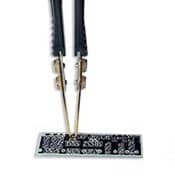 The pin probes connect to LCR-Reader, Smart Tweezers or multimeters using the 4 mm jack plugs. 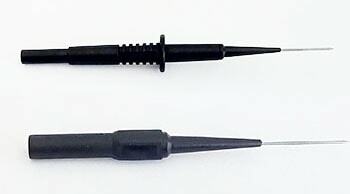 There are two sizes available: the 73 mm long Extra-Fine Pin Probe and the 124 mm long Fine Pin Probe each for only $9.99 USD. Siborg Systems Inc. has recently redesigned the LCR-Reader Store with a new look! The new design feels more akin to other online shopping with the ability to read the product details before adding items to the cart. Siborg has also added new 'Task Kits'. These kits are combinations of a device with spare parts, ie: a Smart Tweezers ST-5S with precision tips and bent tips, or an LCR-Reader with charger and spare battery. Each kit offers customers a better price than buying each piece separately. Visit the newly redesigned LCR-Reader Store! A new gold-plated bent-tip option has been made available as an extra for both Smart Tweezers and LCR-Readers. The bent design is more ergonomic to use as they meet components mounted on PCBs at a more comfortable angle compared to the straight tips. Both devices will still come equipped with the straight tips with the bent design as an optional add-on. Siborg has begun offering NIST Traceable Calibration Certificates with every LCR-Reader. After completion of the new calibration fixture, Siborg began offering customers NIST traceable calibration certificates for LCR-Reader when purchased along with the device in the LCR-Reader Store or when customers purchased the LCR-Reader Professional task kit. 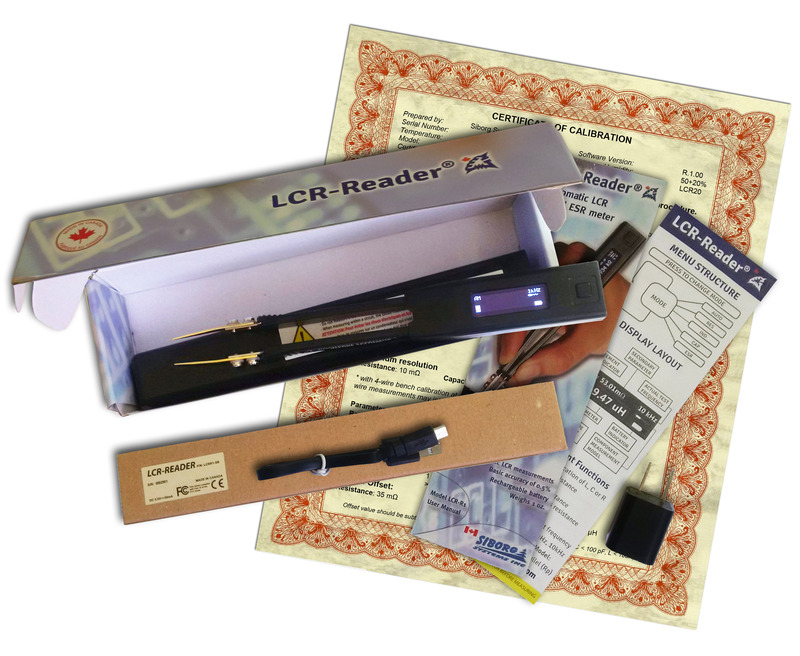 Now, without any extra cost, customers can buy the LCR-Reader with calibration certificate for $199.99 in the LCR-Reader Store. 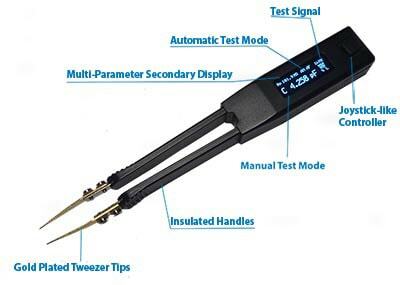 Smart Tweezers™ are a hand held LCR meter that provides users with a simpler method of identifying and evaluating Surface Mount Devices and troubleshooting complex electronic systems. The unique design combines a set of precision gold-plated tweezers and a powerful, yet small digital LCR-meter in a lightweight device. Powered by a Li-Ion battery, Smart Tweezers can identify the type of component and measure for Inductance, Resistance, Capacitance, and ESR values with no set-up. Electronic manufacturing has begun using Surface Mount Technology, where small components (referred to as Surface Mount Devices or SMDs) are mounted directly to a PCB, opposed to the older through-hole method, where wire leads were threaded through holes on the PCB. SMDs are generally very small and may or may not have wire leads or other distinguishing characteristics, making them more difficult to tell apart from one another. This may lead to lost component values, or confusion between components. Smart Tweezers offer users an easier way to sort and identify these components, as well as perform on-board measurements and debugging. The gold-plated tips are Swiss made by IDEAL-TEK S.A. and provide a reliable contact on even the smallest component (to a 0201 size), either loose or mounted. Smart Tweezers are also able to test conventional components that may have wire leads that are too short to fit in test terminals. Measurements are done faster using Smart Tweezers™. The automatic identification function eliminates unnecessary trial and error, thus saving time. When in contact with an SMD, Smart Tweezers automatically determine the type of component, determines the proper measurement range and test frequency, and measures for L, C or R with parallel and series mode. The evaluation results are then instantaneously available on the display, as well as the component type, test parameters and more detailed component analysis such as Z and ESR values. The bright OLED display instantly shows the values, the component type and test parameters used, as well as a more detailed component analysis, such as Z and ESR values. Smart Tweezers are easy to use with just one hand, and without the need to set-up between measurements, users can focus on the task at hand. 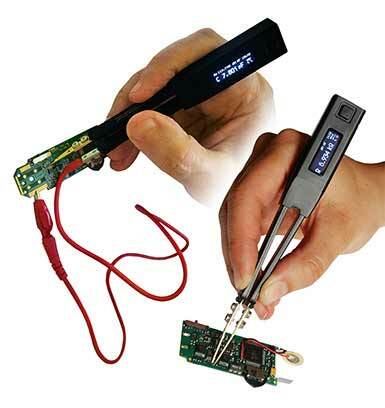 The unique design that combines a set of tweezers and the multimeter in one device makes sorting, testing and troubleshooting become more efficient and cost effective. By only requiring one hand, unlike other multimeters that require both hands to work the wire leads, Smart Tweezers leaves the other hand free for other tasks such as taking notes. The handles on the device are a 4-wire connection and shielded to assure low capacitance and resistance offset while measuring. Manual modes allows the user to test for specific parameters such as L, C, R, Z or ESR. this more also improves component type identification for in-circuit testing. Smart Tweezers are controlled using a joystick navigational button. The joystick movement allows users to easily change basic settings from the home screen by pressing directionally. Left and right changes the measurement mode (A, L, C, R); up and down controls the test frequency. Users can also press the joystick to enter the extensive menus. Within the menus, users can set specific parameters for tasks such as setting offset values, holds, and more. Accuracy Specifications Accuracy is specified at 18°C to 28°C (64°F to 82°F), with relative humidity to 90%.